Safer Anthrax Test Aims To Keep The Bioweapon From Terrorists : Goats and Soda Current tests require growing anthrax in the lab, which isn't the best option for labs in Afghanistan. So engineers have come up with a credit-card-size test that could make the world a safer place. 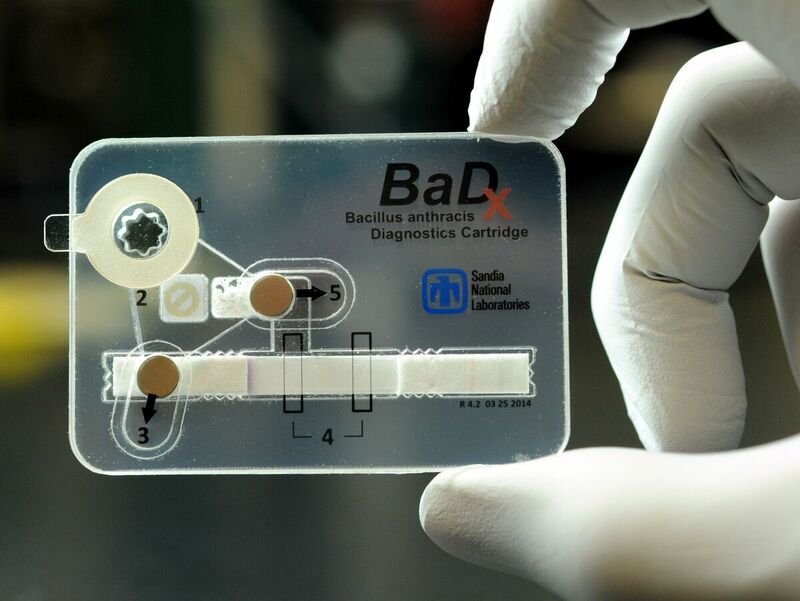 Safe and small: The credit-card-sized test for anthrax destroys the deadly bacteria after the test completes. But veterinarians know about anthrax because it's caused by a bacteria that lives in soil, and it can infect livestock. So veterinary labs have to be able to test for it. Sandia sends vets like Finley to countries around the world to make sure their tests are performed in a secure manner and the anthrax doesn't fall into the wrong hands. "My country happens to be Afghanistan," says Finley. She says Afghanistan has a curious problem when it comes to anthrax. The country is a big exporter of animal hides. But these hides can be contaminated with Bacillus anthracis, the anthrax bacteria. Exporters would like to prove their hides aren't. "If they can certify them free of Bacillus anthracis spores, then they can get more money for the hide," says Finley. For the most reliable test, you have to grow the bacteria. But the U.S. worries that a bunch of labs in Afghanistan growing anthrax won't do much for biological threat reduction. "So we were working with them to try to identify an alternate method," Finley says. She went back to New Mexico and told Sandia engineers she needed a test that would require only a tiny sample that would be destroyed when the test was over. The engineers at Sandia made a credit-card-size device. A sample first goes into a tiny growth chamber, where bacteria in the sample can divide a few times. Then the sample goes into a test chamber. Fifteen minutes later, you get a color change, whether it's positive or negative, "similar to what you might see in a pregnancy test." And then a powerful antiseptic chemical destroys the bacteria. And there's nothing for a terrorist to steal. It'll be a few years before the test is ready for prime time. But if it works as advertised, it should make the world a safer place.